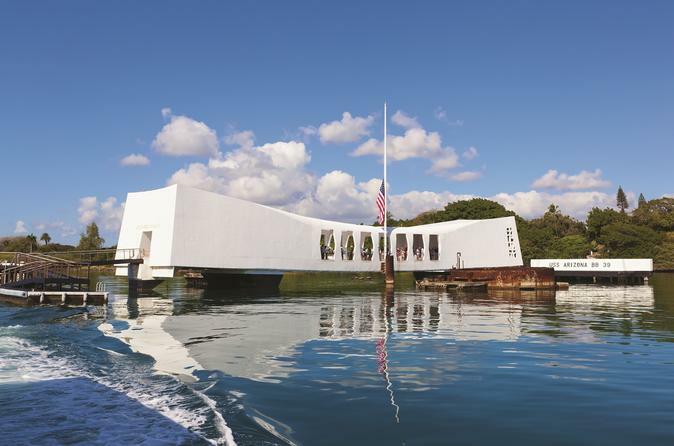 This 5 Star tour features world famous Pearl Harbor’s top two attractions allowing you to visit the USS Arizona Memorial and ship that ended WWII, Battleship USS Missouri. This tour was specially designed and choreographed to allow you to actually stand where WWII started and ended for the United States of America restoring peace to the world if but for a moment. This luxury tour is complemented with a tour of Honolulu’s historic sites narrated to provide important events of Hawaii’s history. Expect those little surprises that make a great tour into experience of a Life-Time. The USS Arizona Memorial program begins with a short film highlighting the historical events leading up to and the attack on Pearl Harbor. Then, board a Navy shuttle to see the magnificent Memorial that rests above the sunken USS Arizona Battleship to remember the 1,177 men still resting within. Included is the award winning audio tour that will guide you through the Pearl Harbor Survivor segments while on board the USS Arizona Memorial and provide a memorable “Path of Attack” tour along the shoreline. The USS Arizona Memorial Narrated Tour is available in English, German, French, Spanish, Japanese, Mandarin and Korean. This incredible self-guided tour will automatically translate the main 23 minute documentary into the visitor’s language. Immerse yourself in the history and stories of Pearl Harbor’s by experiencing the emotions and memories that remain strong to this very day. This tour features an extra feature by journeying through Honolulu to see royal grounds and historical landmarks of Oahu. The statue of King Kamehameha the Great, ‘Iolani Palace, Kawaiaha‘o Church, and Punchbowl Cemetery are just a sneak peek of what you will see from the comfort of your luxury mini-coach. Why choose this amazing Tour? Small group tours in our exclusive mini buses. Individual air flow controls over each seat. Individual cup holders, storage pockets, and seat reclining options. Large viewing windows on all sides of the bus. Extensively trained and knowledgeable navigators well versed in history, Hawaiiana, and service.